Completed in 1916 as the prestigious headquarters of Perpetual Trustees, 39 Hunter Street has stood at the centre of the city’s financial district for more than ninety years. By the early 21st century the interior spaces were cramped and dark due to a succession of poor quality commercial refurbishments. 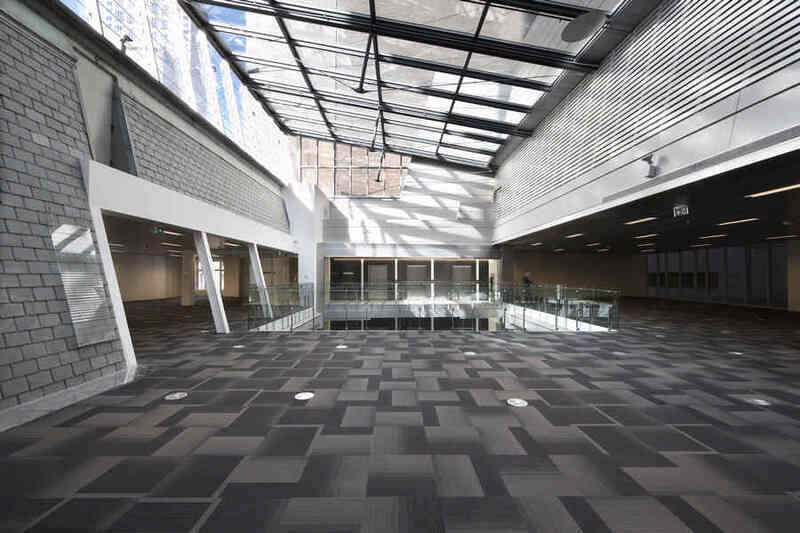 The challenge was to transform the existing building into ‘A grade’ equivalent office space that would achieve a 6 Star Green Star Office Design rating; a first for a heritage building in Australia. Conservation is an inherently sustainable practice. Ageing buildings hold an enormous amount of embodied energy, but their outdated mechanical and services systems are expensive to maintain. At 39 Hunter Street a complex juggling act was performed to maintain, reveal and enhance the key historic features of the building while updating the interior spaces to achieve a 6Star sustainable outcome. A new central atrium extending through the full height of the building allows sunlight to penetrate to the lower floors. This void is defined by operable glass facades on two sides. A glazed roof acts as part of the smoke exhaust strategy with operable glazed louvres allowing hot air to be flushed out of the building. A new raised floor enables all mechanical, electrical and hydraulic services to be located below the floor of each office level. Localised air quality control is provided to allow individual environmental control. An innovative combination of light source and acoustic dampener, the ‘Lily Pads’ also serve as a consolidation device for the new services, such as sprinklers and lighting, which penetrate through from the floor above. The atrium acts as a contemporary design device which serves an environmental function. From a tenant’s perspective, in addition to providing natural light and air flow, the atrium enlivens the internal spaces of the building through movement, views and activity; all important components of contemporary office life. In the context of a heritage building, all ESD design and services initiatives were required to be tested, not only against the usual parameters for new buildings, but for ‘fit’ with the heritage strategy. A pedestrian passing 39 Hunter Street today would notice only the updated entry and foyer at street level and the heritage facade. Only upon entering the building does the dynamic contrast between the new atrium and the heritage structure become apparent. The outcome of this project is a significant heritage building that is now future-proof for the next 25 years.